So, no prizes for guessing that I love these two new milestone releases. Between them they perfectly summarise HMT’s appeal: the ever forward-looking new material and the constant reworking of the past. This new studio disc may be their most obviously expansive release since debut Shoot! In 2011. Both a return to their roots and also an opening up of fresh horizons. Both Approaching and In the Court of the Trolls are classic HMT: a doom-y riff paired with something much more buoyant and driving, subtly askew rhythms, sonic drama, pounding drums, nimble & melodic bass, and guitar lines that directly access the lizard brain and move the body. All that said, they also breathe a little easier than much of the previous material – there’s contrast but not so much tension, instead an almost freewheeling ‘good times’ vibe. Listen to this while driving and your right foot will be inexorably drawn to the floorboard. However, dividing those two ‘classic’ tracks is On Arrival. Here, the model is twisted and we crash into something altogether more sinister. This is the soundtrack to the shards of last night’s nightmare. Bold splashes of exploratory guitar and bass feedback across ferociously independent drums, intensity outraces density, before a dissolution into crunchy feedback – on face value, the closest piece to pure improvisation to date? On “Shoot!”, The Valley stood out as a break (or coda, actually) easing down from the relentlessly inventive rock-jazz roaring. -40 is the big shift in dynamic here, but it takes a much less mellifluous route, taking a simple repetition and then flirting and toying with dissonance, sound effects and the ear’s perception of rhythm. Then, just when you think you can’t take anymore, a contender for the year’s most gorgeous bass riff as Brekken opens Somebody Else Should Be on that Bus, followed eventually by soaring guitar and taut drums. It’s a short but beautiful closer to a short but supremely satisfying album, ending in a bubbling power trio sound-stew. A summary, a retrospective, a celebration… A recasting of the best of three albums reworked and recast in a live environment. You can hear the adrenaline dripping off these performances, with the added bite that comes from having played them over and over; especially the tracks from the first album. For the Air, for example, is stretched out, slowed down, a polished and doom-drenched masterpiece, the detuned tempo bringing an extra touch of menace (and check out Brekken’s short bass solo at around 04:50 – more, please!) The original album track (from the start, one of my favourites) has the sense of a series of exquisite pieces, artfully and carefully stitched together. This live version? This is a seamless whole, no stitches visible (or audible). And it continues. The opening riff of Ashes honed to a razor. The simmering wah & elegantly controlled feedback in Code of Hammurabi before plunging back into the riff. The deeper journey through The Valley. The fuller-throated live sound of Lake Acid. And finally, the blasting through four crowd-pleasers from the “Enfant Terrible” album. 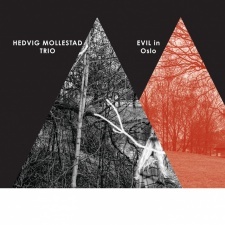 I’m not the biggest fan of live albums… but “Evil in Oslo” serves up precisely what it should: a selection of much-loved tracks, distinct from the studio versions but keeping the necessary hallmarks intact, and with HMT’s indefinable & unmistakable live energy captured. 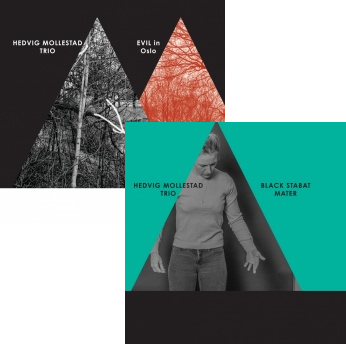 Read anything about the Hedvig Mollestad Trio and the odds are that Black Sabbath and Led Zeppelin get a mention somewhere (including on the latest press release for these albums). It’s true, those are the roots of their sound and those roots are still in evidence. But five albums in, these leviathans of rock don’t spring to mind anywhere near as readily as they once did. 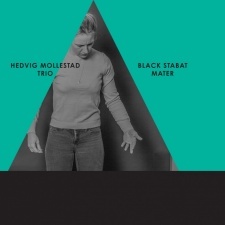 For me, the Hedvig Mollestad Trio sound like the Hedvig Mollestad Trio and there’s no one else (past or present) that sounds quite like them.